Nearing the halfway mark of the 2017 recruiting class in September, the Oregon Ducks have managed to collect roughly half of the expected prospects to sign in February. Just because Oregon has 11 current verbal commitments to date, don’t expect those same 11 to be intact through the letter of intent day. As recruiting goes, there are bound to be some changes ahead. Eugene, Oregon, is not an easy place to recruit to. Compared to states such as California, Texas, Georgia, Florida and Ohio, the state of Oregon does not produce many highly sought after prep stars. This makes it easy for the Ducks to obtain many of the local studs who dream about playing for Oregon their entire lives. Predictably, there are always exceptions. In Part I of II in this series, I will focus on the defensive side of the ball, with Part II discussing the offensive recruiting. Of course, there are challenges with recruiting nationally. Oregon has been able to benefit from snatching athletes from the grasp of the SEC. So far, there are two prospects that have verbally committed to the Ducks that keep it challenging. Defensive tackle, Rutger Reitmaier, attends high school in Tennessee and seems very solid with his commitment despite all the pressure from nearby universities begging him to change his mind. Reitmaier is all Duck at this point. The other national recruit plays on offense and will be mentioned in Part II. The player who has been committed to the Ducks longest — more than a year — is Langi Tuifua from Utah. I don’t know how much communication goes on between Tuifua and the coaching staff of Oregon, but it seems to have lightened up a bit. I’m not saying it is the staff losing interest due to other potential prospects or if Tuifua is fading with interest. Tuifua has a teammate being heavily recruited nationally, Jay Tufele. Tufele has an Oregon offer but doesn’t seem to be biting to join his teammate right away. Tufele may have other interests and try to bring Tuifua along with him. 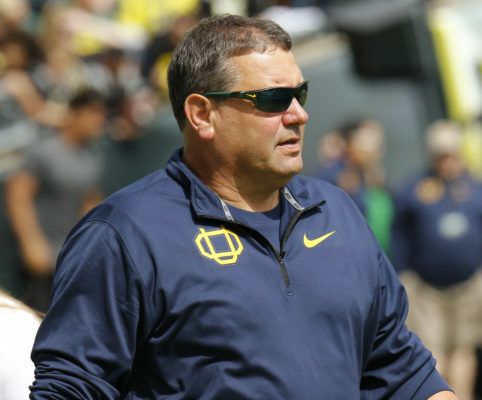 New defensive coordinator Brady Hoke is in Eugene to bring swagger back to the Oregon D.
Both would fit wonderfully in Brady Hoke’s new defensive scheme. Bringing in both South Jordan 4-stars would bolster the defense at some needed positions. It’s no secret that Hoke is trying to bring in some big bodies to the middle of the defensive line. Having Reitmaier is a great start, plus getting Tufele to join Tuifua is better. However, if Hoke can grab one more defensive tackle and flip Marlon Tuipulotu from Washington, the future Duck D-line would appear national-title worthy. Two other tackles that would make a great impact on the line are Martin Andrus and Popo Aumavae. 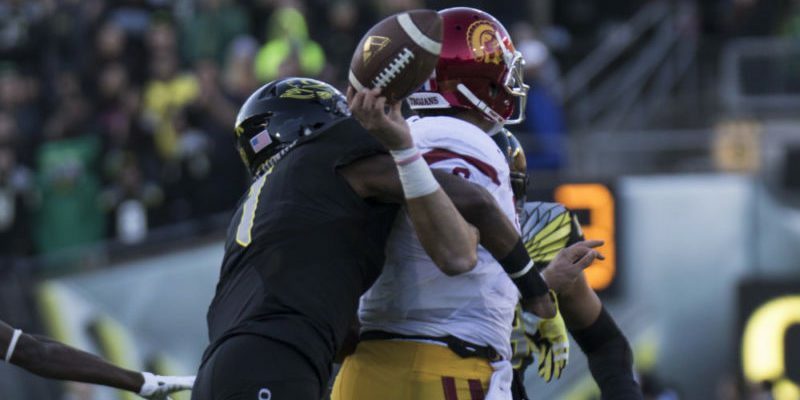 Both have size and strength to help solidify a stout line that keeps Oregon in games. The future of the defensive line has the feel of greatness. Tuifua and maybe Deommodore Lenoir are my biggest concerns that may not remain committed to Oregon and each would be a big blow to the recruiting class. Lenoir helps with recruiting but wants some of his LA buddies to come along with him. A few of them don’t have an offer yet. To keep Lenoir, this may need to change soon. Recently, scout.com broke a story that gets me very excited. 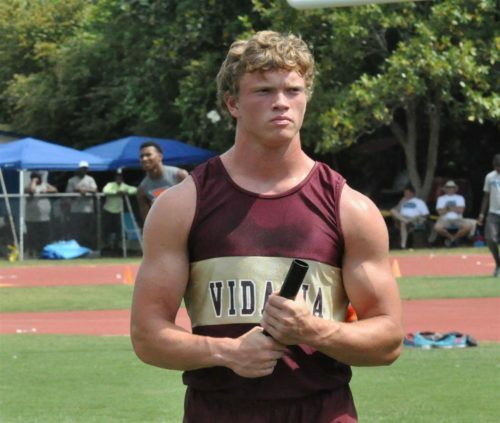 The topic is Nate McBride, the 6-foot-2 225 lb. inside linebacker from Vidalia, Ga. This article states that McBride’s top five has basically become a top two. The local school, Georgia, is in a good position to land this freak of an athlete; Oregon, however, is the other school. McBride is hoping to visit Eugene October 7, in time for the Huskies to come to town. This has potential to be a very influential visit and help Oregon pick up one of my favorite prospects right now. McBride is fluid, quick sideline to sideline and a hard-hitting tackler. Southern elite defenders don’t go West much, but I’m all in for this one. 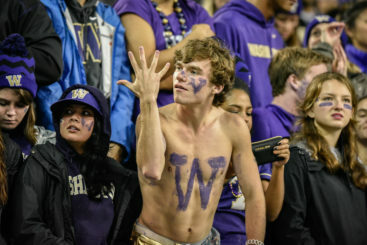 Stunned silence again — after Oregon beats the Huskies 13 years straight. Keeping at linebacker, inside backer Jacob Phillips from Nashville, Tenn., put Oregon in his top 5 list and has an official visit set for September 3 against UC Davis. It’s not a high profile game but it’s great to be considered by another 4-star from the South and get him on campus. If the Ducks pick up Niu, McBride and Phillips, Oregon will be full at linebacker unless one of the 5-star guys has a change of heart. Hoke would easily make room for Baron Browning out of Texas as the No. 8 overall ranked blue-chip or the No. 2 overall Dylan Moses from IMG Academy. Neither would likely happen at this point. Oregon has two commits at the cornerback position and would love to pick up two or three more if the right guys come calling. The three most likely becoming Ducks where the staff would make room for all three are: the local top talent, Elijah Molden, who is an Oregon legacy; the No. 7 corner in the nation, Thomas Graham out of Rancho Cucamonga, Calif.; and Graham’s teammate, Jaylon Redd. A very nice “alternate” would be Elijah Gates in Buena Park, Calif. If Graham commits, his ceiling is so high on either side of the ball, it would allow Oregon the flexibility to prevent any congestion at the corner position and utilize him at receiver. Capping off the defense is the safety position. Only six offers are known to go out to safeties. One in particular, Trajon Cotton, is relatively close to having Oregon high on his list. Cotton, from Sacramento, is fast and vastly underrated. Chaz Ah You is the only other safety that likes Oregon, but being in the top 12 is not saying much for anyone on the list. Ah You will most likely serve a full-time Mormon mission out of high school and his decision may be based on whether the school will honor a position waiting for him after he finishes his two years. A few more names worth mentioning that have been showing love for Oregon are; Odua Isibor, Alden Tofu, My-King Johnson and Terrance Lang. All play defensive end and each is a three-star. I mention these because there is not another program that is better than Oregon at developing classified three-star talent into superstars that get drafted into the NFL, especially at end. Will one or two of these young men be the next man up to prove the recruiting pundits wrong with their star ratings? The length of this article may annoy many, but there is just so much to talk about halfway through this recruiting cycle with Oregon that it’s hard not to leave anything out. To put it into perspective, Duck Territory has listed Oregon offering 138 scholarships so far. Last year they knew of 138 offers for the whole year, including a few eleventh-hour offers due to de-commitments. If the Ducks stop offering now, they would match last year, but we all know that that will not be the case. It’s great seeing the Oregon staff making changes in the recruiting philosophy and evaluation process to find more quality characters who know how to play excellent football. As I stated before, the names and faces will likely change in the next months and more offers will go out to great young men. 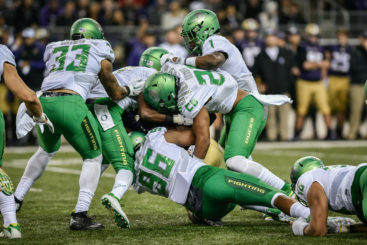 I will say in conclusion, don’t be surprised to see Rahyme Johnson, teammate Nick Pickett and Hawaiian Miki Suguturaga as three of the next defensive recipients of the coveted Oregon offer. Recruiting is wonderful!